“Our planet is a lonely speck in the great enveloping cosmic dark. In our obscurity – in all this vastness – there is no hint that help will come from elsewhere to save us from ourselves.” Carl Sagan, The Pale Blue Dot. Space in your face. Beautiful, beautiful space. Interstellar is an awe inspiring journey across the cosmos that travels to the heart of humanity; flaws and all. Hopelessly optimistic, co-writer and director Christopher Nolan, has delivered a heartfelt science fiction tale. In the distant future, Earth is suffering from climate change and the human population is facing extinction via starvation. Government resources are dedicated to securing the food supply and all other funding, including the military and scientific research, has ceased. NASA is now an underground organisation focused on a mission to find another world to sustain life. A former pilot turned farmer, Cooper (Matthew McConaughey), is recruited to join the crew of ‘Endurance’ (Wes Bentley, Anne Hathaway, David Gyasi and Bill Irwin providing the voice for the robot ‘TARS;) to fly through a wormhole in space and establish a new colony for life in a distant galaxy. Interstellar’s earthbound opening, set mostly on Cooper’s farm, acts like a eulogy for the pioneering spirit of the human race and a slow burn apocalypse with all the trademarks of Nolan’s brand of perceived ‘realism’. Cooper learns high school science text books have been edited to teach children the NASA Apollo Missions were faked by the American Government to bankrupt the Russians – it seems the cynics have won for the greater good. There is nothing subtle about Nolan’s mourning for science and innovation, and Cooper is used as a righteous mouthpiece who speaks in statements as opposed to conversing with anyone. McConaughey’s performance has the stoic quality of a Mercury Seven era astronaut (think All The Right Stuff) but the actor’s trademark drawl and tics are pushed to self-parody levels without the self-awareness. Despite the character’s grandstanding and McConaughey’s shtick, his family values and the relationship with his children is the real gut punch of Insterstellar, and it raises the stakes by condensing the demise of an entire race into one family. Themes of abandonment resonate through the plot (Nolan taking cues from Steven Spielberg) as Cooper’s decision to leave Earth has major repercussions on the family dynamic, particularly the impact of inter-dimensional travel which means minutes in another galaxy equals decades on Earth. Also, Nolan’s optimism is blinding in the face of the insurmountable odds stacked against his characters and there’s a refreshing warmth to the film that a bright spot on Nolan’s resume of stern thrillers and puzzlers. Insterstellar doesn’t get too lofty with its nobility. The crew of the Endeavour and the NASA team on Earth constantly struggle with the consequences of their actions and the burden of the mission. 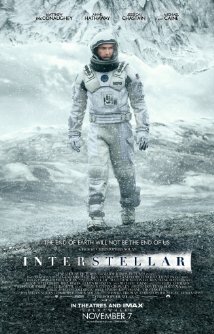 Nolan shows how we are flawed in our ambition and our reckless drive for survival in a universe we barely understand. Villains lurk within the ideals of each character and their moral compass. The underlying forces of time and space are put to the test by Nolan and co-writer Jonathan Nolan who throw around a lot of science jargon and theories to drive the narrative. Luckily, someone is always around with a paper and pen or a nice analogy to break down the complexities without drowning in laborious exposition. The logic police are sure to pick apart every inconsistency, and it’s sad the wonder of Interstellar will be lost on the nit-pickers, because Nolan’s visuals are a reminder of how the power of cinema can heal the little bruises. Sumptuous black holes and the vastness of space with a minuscule spacecraft drifting past makes jaws drop. Interstellar is a reminder of the power of seeing a film on the big screen, and if you’re lucky enough to see it on 70mm IMAX, it’s wonderful to see the epic vistas of space while hearing the flicker of a projector. Sonically, Nolan’s go to composer Hans Zimmer is surprisingly restrained with his score that escalates perfectly as your eyes go wide with the cosmic ballet on show. In 1991, as the Voyager 1 space probe snapped a photo of Earth from 6 billion kilometres, it appeared as a pale blue dot. Sagan noted “our posturings, our imagined self-importance, the delusion that we have some privileged position in the universe, are challenged by this point of pale light”. Interstellar is a tad delusional at times but its ambition is grand, stunning to behold, and humbling in the same way the Voyager 1 image showed us we are merely a tiny spec of a planet. Ah, that’s top work buddy. This tallies with what I’ve read so far. Can’t wait to see it! Not that it’s relevant to you anymore! Well written review, completely agree with your point on the power of cinema! Like your point of view, thank you! Interstellar was an amazing film indeed.